After a lot of enticing press coverage about MexiQ and given that I'm a huge fan of Mexican food and BBQ, I went to check it out last week with Fran, a friend and colleague of mine. What started off as a cold, rainy night, turned into a pleasant (and filling) evening of good food in a cheery, funky atmosphere. I'll get into the details in a minute, but in a nutshell, I think it's a major step up from its weak predecessor, Balu, that a lot of Astorians just couldn't wait to see go. A cross between a bar and restaurant, MexiQ offers a fun, playful vibe with warm colors and cheery decor that isn't too gimmicky. Although the atual space hasn't changed from its predecessor, it's a lot friendlier and not as monochromatic. They've kept the TV screen in the far back right of the restaurant, but instead of scenes of tropical fish, which didn't have much to do with anything, it now showcases vintage Western flicks, further solidifying a Southwestern theme. One other aspect which I have to stress is the awesome (and very eclectic music) we heard throughout our meal. Ranging from The Shins to the more obscure, Mumford and Sons, I really enjoyed their indie music mix--a rarity in 30th Avenue cafes, which are drenched in mass popdom. 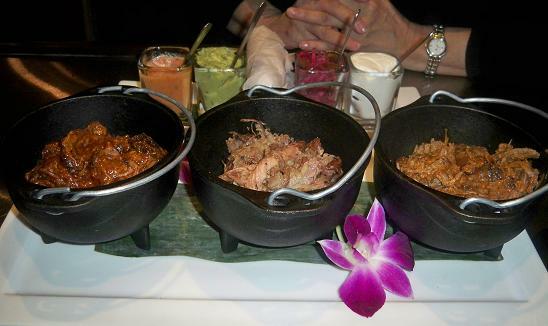 Clear from its name, MexiQ dishes up modern Mexican food with BBQ flavor. Think chicken wings with spicy cilantro achiote BBQ sauce, Mexican style fried chicken, adobo rubbed ribs, pulled pork carnitas and more. Fran and I started off traditionally, with guacamole, then took it up a notch with the braised meat tasting, only to end on a sweet note with a tres leches cake. Guacamole - Although there were four different types of guacamoles on the menu, we chose the most basic of its kind. I was a little disappointed at that, as the other flavors sounded really different, incorporating lime poached shrimp, roasted pork belly and even chicken cracklin'. No matter...the classic would do just fine, I thought. 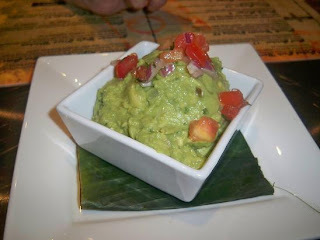 Even though it was passable, I'd leave it at that, as it lacked an injection of flavor and spice that some of the best guacamole has. Overall, I'd suggest more fire and salt. Cazuela Tasting - Fran and I were excited to try this little smorgasbord of braised meat including carnitas, brisket and shortrib. First off, it looked gorgeous, divided into individual cast iron dishes with little shot glasses of fixins including sour cream, pickled red slaw, guacamole and MexiQ's spicy house sauce on the side. There were also two packets of soft flour tortillas, which we opened immediately and filled with the tender meat. I first tried the meats individually, stuffing each in a separate tortilla. But as time went on, I combined the three. All permutations were delicious and smoky, my favorite being the carnitas, which had a slightly sweet taste from a pineapple marinade. The coca-cola reduced shortribs were a close second, with a nice kick at the end and a slightly sweet touch from the coke syrup. Yum! 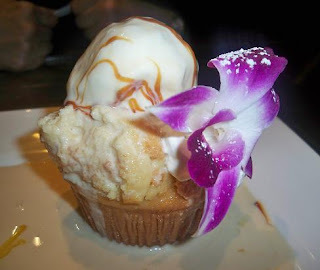 Tres Leches Cake - I was personally running out of room but Fran suggested we try dessert. We went with a tres leches cake that was hard to refuse. It was just divine - a moist, dense cake with tons of flavor on its own, and when drenched in MexiQ's concoction of 3 milks (tres leches) including coconut, condensed and whole milk, it was to die for. On top of that, it had silky caramel on top. Plain and simple, this dessert was legit. Drinks - In addition to all the food, I wanted to mention that MexiQ has an impressive drinks selection, boasting 48 beers on tap. I took advantage of that and tried a special fall brew, the double chocolate stout from Young's. It was a great drink to sip on, on a cold Fall night and went perfectly with the hearty meat and corn based menu items. Our waitress was nice and sort of low-key, which was good. She knew the menu well and checked in on us periodically, without being too overbearing. No complaints at all. I also liked that the servers who gave us our food explained what was on each plate thoroughly and knew their ingredients to the T.
This place looks great! I would kill for some MexiQ food right about now! Cute name! What I can't wait for --- and really, really hope arrives in Astoria soon -- is Jarochan and Yucatecan food. Oh, and tacos al pastor, in the style of a Mexico City taqueria. I know it's just a matter of time, once all the many immigrants have saved enough to open their own restaurants and blow everyone's minds. They need to get to a point where they aren't trying to please all the immigrants by going after lowest common denominator dishes (El Rey) but can specialize and focus on the dishes from their specific states/regions. That will be so exciting. OK, wow, that was a long thought. Anyway, thanks for reviewing the place! I've been curious. Thanks for that thoughtful comment thejoyofvictory. Your points are valid and it would be interesting to experience more indigenous Latin foods. We'll see what surfaces - maybe some are on the way. I have to disagree with the thejoyofvictory.com. While this place is obviously not serving authentic mexican food, it is similarly not serving authentic Tex-Mex either. I don't think they're trying for either. I think they're pretty clear in their ambition to serve food inspired by mexican and tex-mex flavors married with BBQ. Also, D.F. style al pastor tacos are quite easy to find in Astoria. El Athens and Tacos Mexico both serve them off a rotating spit. Thanks Pork - great feedback!